That's just the tip of the proverbial illness ice berg, too! What a lot of these ailments have in common is chronic pain. Shooting, stabbing, radiating, achy, crampy, burning...You name it, I've probably felt it, am feeling it, or will feel it in the future. The pain that's most common and is with me on a daily basis would be the joint, muscle and nerve pain; that deep ache that just never seems to go away and gets worse with things like food and weather changes. This is why when I came across the opportunity to try Ateevia Botanica, an all natural pain-relieving cream that helps a multitude of different pain ailments, I jumped at the opportunity! "Ateevia Botanica is a powerful biochemical storehouse of vital phytonutrients compelling in fighting inflammatory activity. Power-packed with essential anti-inflammatory nutrients, such as antioxidants, flavonoids, lignans (as well as oleic and linoleic acids), Ateevia uses Mother Nature’s own medicine to conquer inflammatory pain naturally and safely." 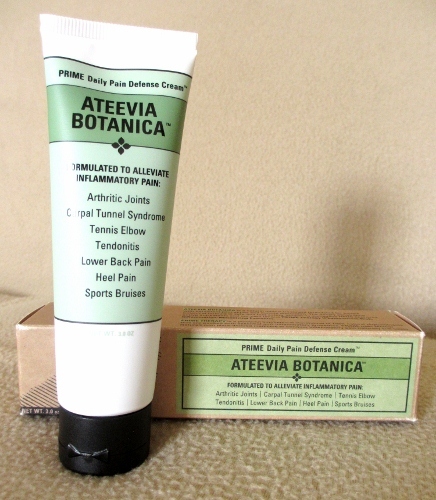 Recommended by physicians and physical therapists, not only is Ateevia Botanica an all natural product, but it's deeply penetrating, fast acting and most importantly, safe to use on many different pain-causing ailments like Arthritis, Carpal Tunnel Syndrome, Plantar Fasciitis, back pain, sports injuries, and many more! Unlike many other people who have chronic pain issues and who are able to take medicines to keep them at bay, I unfortunately can't take ANYTHING due to severe sensitivities and major medical tolerances. Example: I might pop a few Vicodin and absolutely nothing happens. This is exactly why I've given up (mostly anyway) on medical prescriptions and am leaning more towards natural therapies to help keep things under control. 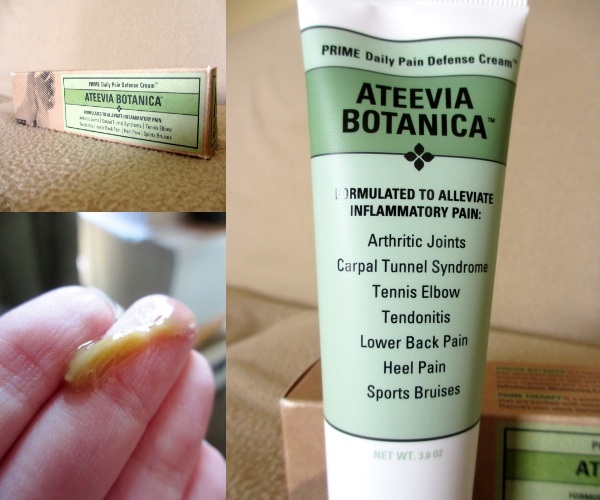 I'm always on the lookout for something new I can try that could possibly help, so I was definitely excited when approved for the Ateevia Botanica review! I always make sure to check ingredients to make absolutely sure things are natural and that nothing is being snuck in under our noses, so I was very happy to see on the bottle itself that everything is on the up and up. Reading the description of the product itself, I was curious to see what type of applicator I would end up being; some people can use a little bit of cream and it will last them awhile and some people need to constantly apply throughout the day to keep the pain at bay. I'm pretty sure I was the latter of those two-while I noticed a slight difference in my pain level immediately after applications, as well as a neat warming sensation, there was never really a considerable difference and the pain would always return, which was expected. I have yet to see any sort of difference other then that, but I still enjoy the slight reduction in pain (every little bit counts, right?) and am holding hope I'll notice a greater difference after multiple applications! While the Ateevia Botanica is known for it's natural properties, which I greatly appreciate, the one thing that really bothered me was its smell. It's not a horrible smell mind you, but being sensitive to many different scents I just couldn't get used to it. i love how different people respond different to products I tried this and is took my foot pain away and kept it away for about 6 hours. but yet it didn't work for my mom's shoulder pain at all. Hmm.. I may have to check this out! I have rheumatoid arthritis, and when I get achy.. not much helps! Thanks for the review! Thorough yet honest review. Now I really like that! Great job girlfriend.